With warm, traditional illustrations and the story of Jesus retold by V. Gilbert Beers, this gift book brings the people and events alive and helps children to see Jesus as more than a character in a story. It includes 52 simple stories of Jesus' life. 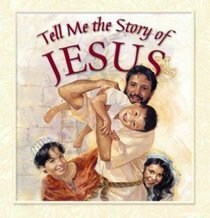 About "Tell Me the Story of Jesus"
GIL BEERS is a respected author and professional in the publishing industry. He has written more than 100 books for children, (more than a dozen have appeared on the best-seller lists), including The One Year Bible for Children, The Early Reader's Bible, The Toddlers Bible and The Step-by-Step Bible. Gil is the father of five and the grandfather of 11. He lives in Elgin, Illinois.- Publisher.